Is an East Asia-style boom under way? Once considered hopeless, much of sub-Saharan Africa is booming. 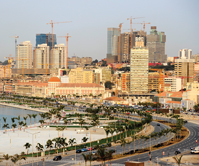 Seven of the world's 10 fastest-growing economies currently are in Africa. High prices for the continent's oil and mineral exports have brought a surge of government revenue and investment, but the growth is occurring in commodity-poor countries as well. Better governance, less war and the rapid spread of cell phones and other communication technologies are fostering growth even in nations with few natural resources. Debt forgiveness and the rise of China, India and other emerging markets as trading partners and sources of investment also have spurred economies forward. Demographers say that with the continent's working-age population projected to expand by a third by 2020, Africa could benefit from a “demographic dividend” that would fuel sustained economic growth, even as populations in developed countries and Asia are growing older. Yet, the population boom also poses challenges: Africa's economies must provide enough jobs for the growing number of workers with expectations of a better life.